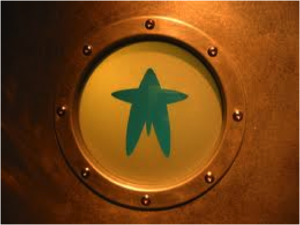 I decided to write a short post about Ambiguous Toilet Sign Syndrome or A.T.S.S, a term I just invented which occurs twice or thrice in our lifetime, when we arrive at the 2 toilet doors of a restaurant/pub, and upon looking at the signs on the doors, we have no idea which one we should be entering. In the example above, you can check out which melon slice you are, and in the one below, I’m questioning whether Men and women really wear bow ties differently? 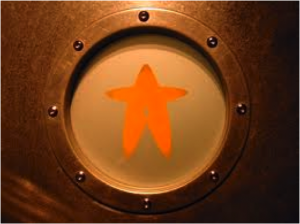 Although unlikely to be faced with A.T.S.S when faced with the following image, this next unusual example shows how restaurant owners have created an under water experience on their bathroom doors by adding colourful, sea-life genitalia! Clearly the intention of having ambiguous toilet signs is not to have baffled customers clutching at their groins and crossing their legs in the restaurant’s common parts, but more likely to entertain and amuse. 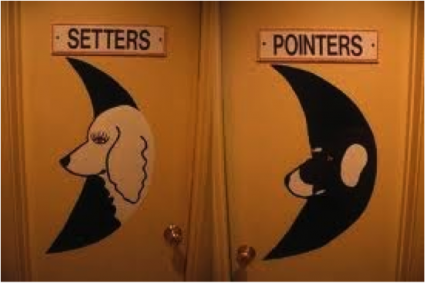 By the way, are you a pointer or a setter?! That’s funny!!! Though I don’t understand why you would think the first one is a melon and not a pizza!!! As for the bow, the point is one is a bow tie the other one is a hair bow….ahhhhhh…. cute! Ha! Brilliant! 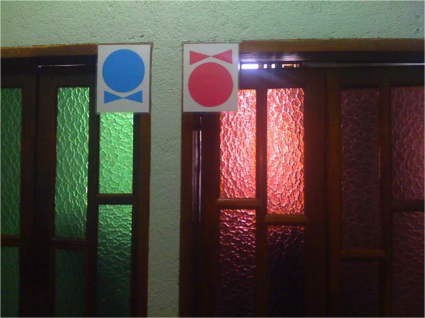 I have been baffled in the past by ambiguous toilet signs. Especially when they use high metaphor.